It started with the words so many air passengers dread, the airport you are headed for is fog-bound and the plane is being diverted. It was January 1971 and Bill Backer, the creative director on the Coca-Cola account for the McCann-Erickson advertising agency, was traveling to London to join two British songwriters, Billy Davis and Roger Cook, to write some new radio commercials that would then be recorded by the popular singing group the New Seekers. As the plane approached Great Britain, heavy fog at London’s Heathrow Airport forced it to land instead at Shannon Airport, Ireland. Shannon is a small city in Ireland and accommodation is limited so the mood of the already annoyed passengers wasn’t improved when they were told that they would have to share rooms at the one available hotel or to sleep at the airport. Tensions and tempers ran high. Overnight something miraculous seemed to have happened and the mood had changed. Sitting in the airport coffee shop the next morning still waiting for clearance to fly, Backer looked around and noticed that several of the passengers who had been among the most irate were now laughing and sharing stories over bottles of Coke. Backer scribbled the line “I’d like to buy the world a Coke” on a napkin. The flight never did reach London as Heathrow Airport was still fogged in, so the Backer and the other passengers were redirected to Liverpool and bussed to London, arriving around midnight. It’s the real thing, Coke is what the world wants today. It was recorded by the then popular group The New Seekers on February 12, 1971, “I’d Like to Buy the World a Coke” was sent out to radio stations throughout the United States. The Coca-Cola bottlers hated the ad and most refused to buy airtime for it. The few times the ad was played, the public paid no attention. Bill Backer’s idea that Coke connected people appeared to be dead. 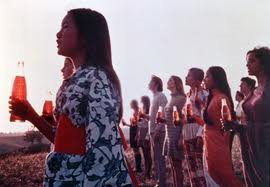 Backer however was still a believer and with McCann managed to persuade Coca-Cola that there was still something in the ad but that it needed a visual dimension. 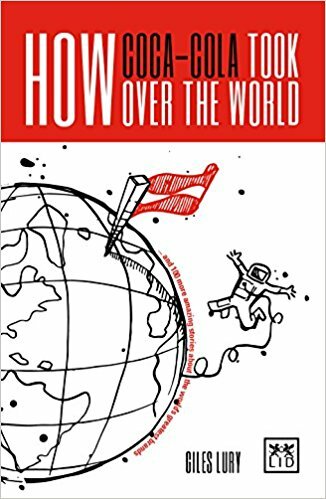 The idea for that visual dimension came from Harvey Gabor, a young art director who suggested that the song could be the basis for a television commercial featuring the “First United Chorus of the World.” – a group of young people from all nations, in clothing representing their nationalities, singing the song on a green hillside. The weather again seemed to want to play a role and the original plan to shoot on the White Cliffs of Dover was scuppered by three days of continuous rain so the location was switched to Rome. The finished ad “Hilltop” was released first in Europe, where it received a warm but not exceptional response, but when it was subsequently released in the U.S. in July, 1971, the response was immediate and dramatic. By November Coca-Cola had received more than a hundred thousand letters about the ad. People were calling radio stations and asking them to play the song but as it was a commercial this wasn’t possible so Bill Backer rewrote the lyrics without the references to Coke. Because the New Seekers were initially unavailable to record the new version, a group calling itself the Hillside Singers recorded and released it as a single. Several weeks later as The New Seekers were beginning their American tour, they too re-recorded the song but this time with the new lyrics and released a second single. Both versions sold well and at one point, the New Seekers’ version was in the top 10 while the Hillside Singers version was number 13. For more years than I care to remember, Cadbury’s Creme Eggs have been part of my Easter. Yet for many of those years there has been a little nagging feeling at the back of mind. They reminded me of another product from my youth but one I couldn’t ever quite put my finger on it. that’s is until now when I decided to research the origins of the Cadbury’s Creme Egg and then all was revealed. How do you brand yours? In 1875, Cadbury made their first Easter eggs. They were made with dark chocolate and had a smooth, plain surface. They were filled with sugar-coated chocolate drops known as ‘dragees’. Later they made Easter eggs that were decorated and had their plain shells enhanced with chocolate piping and marzipan flowers. They are made by pouring liquid chocolate into a half-egg shaped mold, which is then filled with white fondant and a dab of yellow fondant. Because the fondant has a greater density than chocolate, the two don’t mix together and the fondant pushes the chocolate outwards. The two halves are then quickly closed and cooled to allow the chocolate to set. 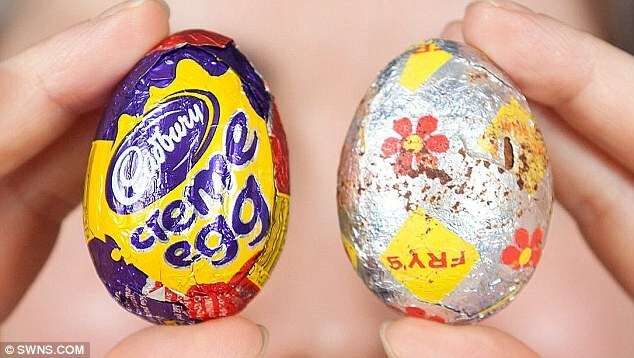 Yet they aren’t the original cream egg and they owe their origins and fondant to another brand – Fry’s Chocolate Cream. Joseph Storrs Fry was a revolutionary in the chocolate world, when in 1847 through his addition of cocoa butter to a mix of cocoa powder and sugar and the use of a Watt’s steam engine he created a bar that could be moulded and mass-produced. Joseph’s firm, J.S. Fry & Son, began producing the Fry’s Chocolate Cream bar in 1866. It consisted of a white creamy fondant centre enrobed in dark chocolate. It was extremely successful, spawning a variety of flavours including Fry’s Orange Cream and Fry’s Peppermint Cream. Cadbury and Fry had been part of the same holding company, the British Cocoa and Chocolate Company, since 1919, but in 1971 Cadbury completed a take-over. One of the ensuing changes was the rebranding and relaunch of the Fry’s Cream Eggs …as Cadbury’s Cream Eggs. Footnote 2: A recent Cadbury survey claims 53 percent of people bite off the top, lick out the cream, then eat the chocolate, 20 percent just bite straight through and 6 percent use their finger to scoop out the cream. Most of the stories I have written are about successes but you can learn a lot from failure, not least to accept it and move on. So this week the story of a brand that started well but quickly faded and then died. Since Richard Branson started his first business in 1966, the Virgin name has been applied to close on a hundred different companies. Everything from railways to make-up, from vodka to video. Some have been incredibly successful like Virgin Records, Virgin Atlantic and Virgin Media. Some haven’t. In fact, some have been incredibly unsuccessful, sinking without trace. This is the story of one of the biggest failures. Virgin Cola was set up during the early 1990s in conjunction with Cott, a Canadian company that specialises in bottling own-label drinks. Cott was looking for a major brand that could have global appeal and thought they had found the perfect match in Virgin. Branson too had high hopes for the brand and having secured a distribution deal with Tesco in 1994, the brand got off to a flying start. “The business that looked like it was going to become the number one business in the world was Virgin Cola. We decided to take on the might of Coca Cola. We had a great brand. It tasted better than Coke. 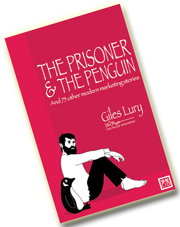 However after that first year things got a lot tougher, Coke went on the attack increasing its marketing spend and doing widespread promotions which reduced any price advantage Virgin offered. Soon Virgin Cola started to lose share and with it shelf space and even distribution. Virgin tried to respond. In 1996 they decided anything Coke could do they could do better and they launched “The Pammy”. The Pammy was a specially designed 500ml bottle, with a curvaceously contoured body designed to resemble Pamela Anderson, the Baywatch actress who was at the height of her popularity in the UK. It was both a homage and a pastiche of the classic Coke bottle which is often known as the Mae West bottle as its contours have been compared with those of that famous actress from the 1930s. Increasingly desperate Branson decided if they couldn’t beat Coke in the UK why not take the fight to Coke’s homeland, the USA. In 1998 Virgin Cola was launched onto the US market in spectacular style. Branson rode a vintage Sherman tank through New York’s Times Square, taking aim at a huge Coca-Cola billboard. He then placed a 40-foot Virgin Cola billboard right above the Times Square Virgin Megastore. Virgin Drinks USA subsequently agreed distribution channels with US retailers such as Target but success was again limited and the company closed in April 2001, having managed to establish no more than 0.5% volume share of the market. In 2002, a vanilla cola called Virgin Vanilla was launched in the UK, ahead of the launch of a similar product from rival Coca-Cola. In 2007, Silver Spring acquired the UK license. However, in 2012 that company fell into administration and ceased production. No company acquired the UK Virgin Cola licence in its place. But when he presented his idea to his uncle Edwin (Ted) Street, who had founded the company in the 1930s along with his brother Daniel, Ron’s father, he was not taken with the idea. In fact Ted told Ron that it would be a ‘nine day wonder’. However Ron, who had chosen a career in the family ice cream business after refusing an offer to join NASA’s space program as an engineer, was convinced of its potential and so continued working on his idea The lolly was six months in development and during that time acquired its name “The Paddle Pop” because its shape resembled that of a paddle. When it was finally launched in 1953 it was an immediate success. Ron remembers it fondly and when, on the brand’s sixtieth birthday, he was asked about that time, he recalls that “it took off like a wildfire, it just took off”. In fact it was so popular the factory had to put on an extra shift of workers and Paddle Pops were only produced in chocolate for the first two years, despite plans for other flavours. Other flavours, including Ron’s favourite, caramel, were introduced later in the 1950s. 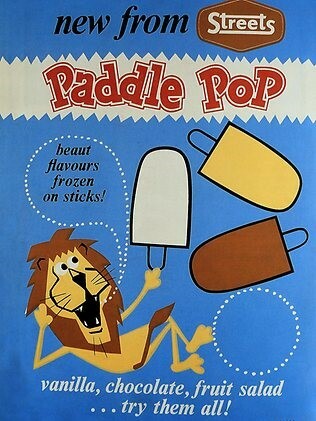 In 1960 Unilever bought Streets and Paddle Pops acquired its shaggy-maned icon, the Paddle Pop Lion. The brand still flourishes today, long after those nine days ran out. Footnote: Paddle Pops have become such a part of Australian culture that one of the most popular forms of fencing is known as Paddle Pop Picket as each strut looks like a Paddle Pop lolly stick. One day in 1971, Carolyn Davidson, a design student at Portland State University, was sitting in a hallway working on a drawing assignment and bemoaning the fact that she couldn’t afford to take an oil painting class. A young associate professor overheard her and asked if she wanted to do some work for him and his fledgling company. He offered to pay her $2 an hour. She accepted. Phil Knight was that young associate professor of accounting at PSU. He had taken the job to supplement the modest income he made running Blue Ribbon Sports, Inc. – a small, fledgling company that served as a West Coast distributor of Japanese-made Tiger brand sneakers in the U.S.
Carolyn’s initial work involved making charts and graphs for his BRS meetings with executives visiting from Japan. Phil however had bigger plans and wanted to start selling his own brand of cleated shoes for football or soccer that he was having made in Mexico. He gave Carolyn a new brief. He wanted an identity, a “stripe”, which was the industry term for a shoe logo. Phil told her it needed to convey motion and that it couldn’t look like the logos of Adidas, Puma or Onitsuka’s Tiger. Carolyn said that was all she had to show. Phil and his team were pressed for time and after discussion it became clear that all three men were at least willing to accept the one of the designs. The “checkmark” they chose just happened to be Carolyn’s favourite too. Phil summed up his thoughts at the time saying “Well, I don’t love it, but maybe it will grow on me” and because they needed it so quickly, Carolyn didn’t even have any time to refine or clean-up her initial design. In 1972, the company first began selling shoes with the Nike name, named after the Greek goddess of victory. In June 1972, the first running shoes bearing the Swoosh were introduced at the U.S. Track and Field Olympic Trials in Eugene, Oregon. For her services, she billed the company for 17.5 hours of her time …$35. Footnote: Carolyn graduated from PSU in 1971 with a bachelor’s in graphic design. She continued to work for Nike designing ads, brochures, posters and catalogues. 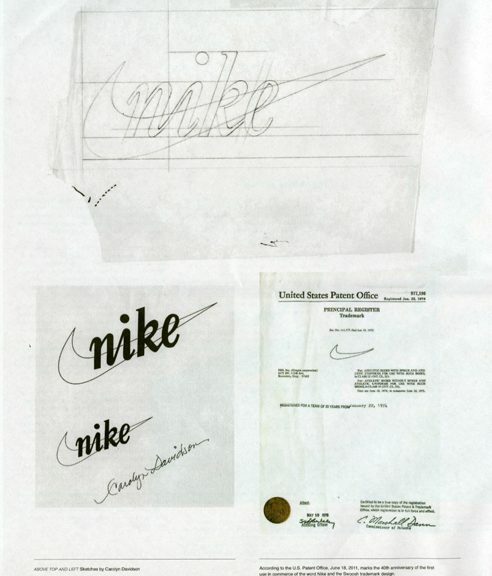 As the company grew exponentially there came a point late in 1975 when it became clear that her one-person design shop was too small to handle all of Nike’s advertising and design needs. Nike and Carolyn agreed it was time for a full-service ad agency. She opted to split her time home-making and doing some freelance design work. In 1983, three years after it went public, the executives at Nike surprised her with a party. In additional to presenting her with a gold ring in the shape of her Swoosh, complete with a small diamond, they also gave her a certificate of appreciation and 500 shares of stock. She has never sold the shares and they are worth between $½-1 million today.